Disclosure: I was sent a screener by the vendor in order to review. All views shared are mine and mine alone. Being dog lovers, my family goes crazy for family friendly movies featuring furry pups. And, when I saw a press release come through my email about Pups United being released from Lionsgate Home Entertainment back on Sept. 15th, I couldn't wait to get my hands on a copy to watch during one of our weekly movie nights. Out of my two girls, my oldest Savannah, is the one who goes crazy for all things puppies. I have lost count of how many plush toys she has, including the bed full that she sleeps with each night. So, I knew she would go crazy when she saw this DVD arrive in the mail...and, she did. She thought the dogs looked cute dressed in soccer jerseys and couldn't wait to watch it. And, I was excited to see that this was a Dove-approved movie, so I didn't have to worry about screening it beforehand for inappropriate content. "Gear up for a four-legged adventure when Pups United which arrived on DVD (plus Digital), Digital HD and On Demand September 15th from Lionsgate Home Entertainment. Awarded the Dove Seal of Approval, the film is “a fun family movie that everyone will enjoy” (The Dove Foundation). In the vein of Air Bud, this live action movie features the voice talents of Rob Schneider (Grown Ups) in this furry quest to rescue the World Cup. 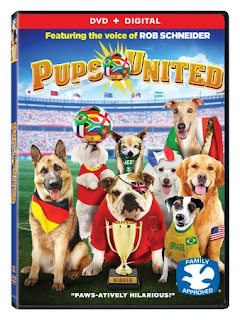 The Pups United DVD, including a behind-the-scenes featurette and Miniscule bonus episodes, is now available for the suggested retail price of $19.98. A rag-tag gang of international talking dog mascots must save the day and foil the plot of villains planning to sabotage the Youth World Cup soccer finals." Title Copyright: © 2015 Pups United of Ohio, LLC. All Rights Reserved.